A one-block protected bike lane pilot on Central Square in Cambridge, Massachusetts. Photo: Cambridge Bicycle Safety. Here’s an idea for cities worried about winter’s impact on protected bike lanes: try putting one in and see how it works. Snow clearance is a legitimately big deal for protected bike lanes. For a protected bike lane to serve people who don’t currently bike — and that’s the whole point — snowy cities need a snow plan. As the Boston Globe reported Friday, Cambridge is putting its snow-removal practice to a very practical test: it’s building a temporary protected bike lane this winter with the explicit goal of learning more about snow removal. “We certainly intend to keep these in place over the winter, since a big part of the demonstration is to understand how the flexible delineators last through snowplowing,” Cambridge transportation director Joseph Barr told the newspaper. As we reported earlier this year in our close look at removing snow from protected bike lanes, snow clearance practices depend heavily on local climate. Different snow drops in different cities. For people whose job it is to clear snow, this may mean that the best way to come up with a new routine may be to test it in real life. A Kubota sweeper/plow, center left, clears the sidewalk at 300 South and 200 West, Salt Lake City. Image: SLC. Last week, MinnPost published its own excellent and detailed overview by Minneapolis writer Bill Lindeke of snow removal from protected bike lanes in that winter city. It’s a good read for any city trying to use both snow plows and fragile flexposts. 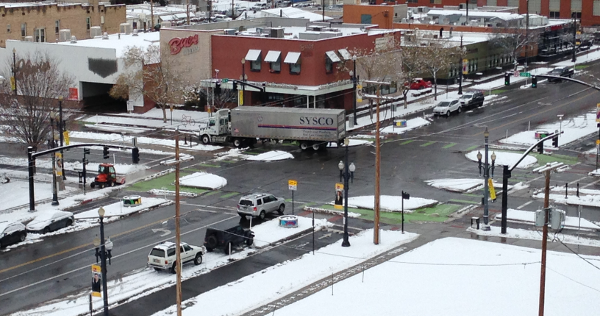 Among Lindeke’s important points: snow removal from painted bike lanes is already terrible. When plows are forced to go around the inevitable parked cars, illegally lingering, you get “a half-moon” of snow that ruins the bike lane. The second big problem is a simple question of weight ratios. A 200-pound bicycle-and-rider does not have the same impact as a 2-ton car. When cars drive over unplowed snow to park, they compact it into a dense sheet that becomes impossible to plow using conventional equipment. Meanwhile, in the travel lane, the repeated passage of heavy tires has a “clearing” effect, pushing the mixture of snow and salt to the side. The end result is a clear car lane and a bike lane full of dangerous crap. Because they tend to be wider, and include more physical space between bike and car traffic, protected bike lane offers a place to put snow. And if protected bike lanes prompt cities to actually keep bikeways rideable through the winter, that’d be more than most cities can say about their status quo. The Green Lane Project is a PeopleForBikes program that helps U.S. cities build better bike lanes. Our next phase is the Big Jump Project, which will select 10 very different neighborhoods and districts and help them quickly connect biking networks.